Main features are: COLUMN: Robert Llewellyn. FIRST DRIVE: KIA Niro Hybrid. FIRST DRIVE: KIA Optima PHEV. AA Chargemaster EV Myth Busting. FEATURE: Breaking Down in an EV. 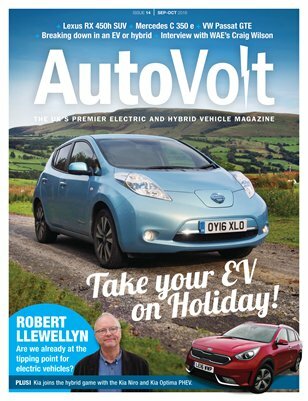 FEATURE: Take Your EV on Holiday! INTERVIEW: Craig Wilson MD of Williams Advanced. TECHNOLOGY: Motor Controllers. DRIVEN: VW Passat GTE. DRIVEN: Mercedes C 350 e. DRIVEN: Lexus RX 450h. LONG TERM: Nissan Leaf 30kWh. BUYING GUIDE: Toyota Prius Gen-1. The latest EV and hybrid news, plus handy guides explaining electric and hybrid vehicles to both the beginner and enthusiast alike complement every issue.